With the help of the SSNSC and the Talking Information Center, Hoadley developed the Tupelo Trail for Blind Hikers. The trail features series of posts that detail the natural surroundings for those with and without visual impairments by including both written and braille texts for hikers. Ryan Conforti, 18, stands in front of the boat rack he built for the Cohasset Maritime Institute as part of his Eagle Scout Project. Ryan Conforti built a boat rack to benefit of the Cohasset Maritime Institute and the Center for Student Coastal Research. The structure, made of pressure-treated lumber, can hold up to eight boats and can accommodate several kinds of boats such as kayaks, canoes, single rowing boats, and double rowing boats. Conforti said he and his designated Eagle Advisor, Phil Lehr, remained in constant contact for weeks on end as the two attempted to complete the project before Conforti departed for college on Aug. 18. With the help of Lehr and some of his brother’s friends, Conforti completed the project on Aug. 13, with just days to spare. Brent Landquist said the decision to build a new work bench for the Recycle Transfer Facility came after spending large chunks of time at the RTF bottle return station, where Troop 28 would raise funds for trips and other troop activities, and noticing the poor condition the previous work bench was in. To ensure the bench lasts as long as possible, Landquist used special types of wood that would extend the life span of the piece. Landquist said the quality of the tools used back when the previous bench was constructed 30 years ago are not nearly as (good) as tools are now, and that the new bench should last for close to 70 years. 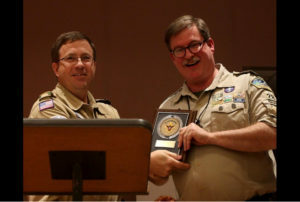 Jack Colamaria of Old Colony Council presents Rob Hillman with the Outstanding Scoutmaster Award.